Extract: "In previous launches, Schilling’s companies have registered thousands — even tens out thousands — of names ahead of general availability launch. That left frustrated domainers searching through the scraps. This was especially notable because Shilling said last January they they wouldn’t hold many domains back". Extract: "About 95,000 names in gTLDs such as .nyc, .tattoo, .webcam and .wang have already ended their mandatory “controlled interruption” period and hundreds of thousands more are expected to be unblocked on a weekly basis over the coming months (and years)". Extract: Chick-fil-A, Inc. also registered the domain name chick-fil-atruettsluau.restaurant on the 6th of November that costed about $3,200. So an estimate for the total cost is between $91,000 to $100,000 for the 8 .restaurant domain names. Domainers register their .RESTAURANT domain names with Uniregistry. 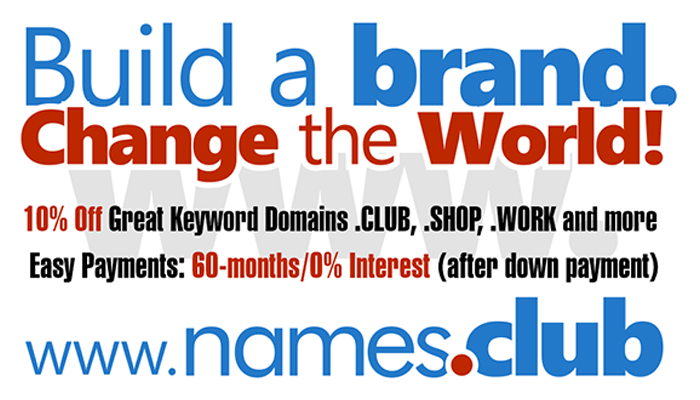 What makes Domain Cost Club so great? Extract: I’ve known Bill McClure for a few years, having met him at several domain conferences, and I admire his business successes. I’ve written about him before, from buying Coffee.org for $100,000 and building a big business on it, to buying Bouquet.com at auction. There has been quite a bit of discussion about the Coffee.Club deal, and I think the deal is good for both parties. Extract: If you want to see what domains people are registering take a look below. There are over 500 comments from readers. (I assumed that more than 95% of the people that voted are domain investors. The poll has less than 4.4% margin of error but it is not a scientific poll by any standards). Let us know a bit about the plans you have for your business that will use the name as the primary web address. If approved, you’ll be able to purchase the premium .CLUB name for 10 equal annual payments, interest free. For example, if AwesomeName.club is listed for $40,000, you’d be able to obtain the name and start using it for your business for $4,000/year for 10 years. After that the name is yours for as long as you continue to renew it at standard general availability pricing (currently approx. $15.00/year). Extract: Adam Dicker (Developer of the Year), Dave Evanson (Broker of the Year), Michael Cyger (Blogger of the Year), .CLUB (Most Promising New gTLD and Best New gTLD Marketing), DomainNameSales.com (Best Overall Domain Solution), Uniregistry (Sponsor of the Year), Adam Dicker (Domainer of the Year), Richard Lau (Bandit Berkits Goodwill Ambassador Award), Ilze Kaulins-Plaskacz (Women in Domaing – a new award), and John Berryhill and Michael Cyger (Domain Hall of Fame, and Ren Warmuz (Special Domain Hall of Fame honor is his memory). Extract: The domain name Marijuana.NYC sold today for a whopping $60,920. Earlier this week the domain name cannabis.nyc” sold for just $3,600 in the first of three landrush auction rounds.